FLOWERFUL. The Menomonie Farmers Market is all about fresh, locally-grown produce, sure, but its vendors carry everything from flowers to jewelry to henna tattoos to pizza to ... I mean, do we need to keep going? By their nature, trends are transient, moving to the trash bins of our past once society deems them uncool (I betray my youth, but those oh-so-not-lovely neon colorblock jackets of the early ’90s come to mind). Not all trends are transient, however, not all are uncool, and some become incorporated into communities so deeply that they lose the label “trend” and become tradition. 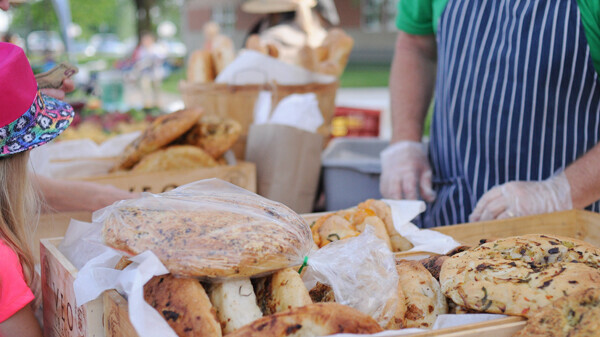 Eating local is considered a trend by some, but with years of history connecting them to their communities, farmers markets have become one of the best parts of summer, especially for residents of the Chippewa Valley. The Downtown Eau Claire Farmers Market is a titan in the area, but it’s important to shift the focus on occasion to smaller, equally valuable venues. It’s true. At the market, you have all the ingredients of summer that fall prey to stereotypes in writing, but are simply the best in real life: huge trees dappling the sunlight, local folk musicians that smile at you when you walk past, vendors’ kids pretending sticks are swords, and the persistent odor of fresh doughnuts and egg rolls that you can purchase for a miser’s price. Let’s not forget the fresh produce, however. 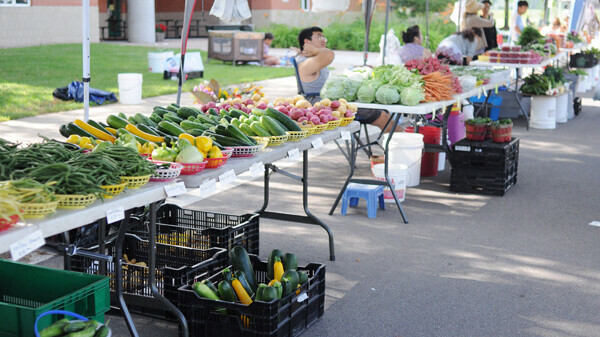 Despite the variety of artisan products available at the market (cheese, crafts, bread, flowers, canned goods) and the food vendors, fresh produce is the reason most of us visit farmers markets, and it’s available in abundance, especially from the Hmong vendors. Some of the Hmong farmers have been vendors at the market for over a decade – and not necessarily to make a profit. Ker and her family, like many vendors, are young, but they’re dedicated to the market, and often donate their leftover produce to food pantries. “We have a loyalty to Dunn County,” said Scott Hatella, who owns Consuming Fire, a mobile pizza oven, with his wife, Cindy. Other vendors – notably, Hillside Henna and Beloved Sisters – explained that their motivation to participate in the farmers market stemmed from a desire to educate consumers and provide quality, natural products with pronounceable ingredients. The purveyors of Beloved Sisters, Sarah Jones and Veronika Zazovsky, sell an assortment of handmade products, including jewelry, accessories, and deliciously crisp Russian pickles – but their focus is on natural, organic body care products. Years of research have contributed to the fine products they now sell, Sarah explained, but when asked about the success of their business at the farmers market, Veronika shrugged slightly. Some business owners might resent competition, but the goal isn’t profit. “I want to make money, yes, but it’s more important for me to educate people rather than sell,” she said, explaining that her sister Natalia, the inspiration behind the business’s name, passed away because of a cancer that can be caused by dangerous chemicals and ingredients in conventional, non-natural body products. Katie Rose of Hillside Henna also expressed the importance of knowing your ingredients. “We like to know what’s in our (henna) paste,” she said, explaining that some sellers of henna powder mix it with toxic chemicals – not something you want on your skin. Whether on your skin or in your mouth, the Menomonie Farmers Market and its devoted vendors aim to provide products and produce that are natural, for the good of the community. With the support of its visitors, the market will continue to flourish as a much-loved tradition of summer in the Chippewa Valley — and I invite you to leave any cynicism in the parking lot, because at the Menomonie Farmers Market the people and the produce are, impressively, the cream of the crop.